Eva Hesse, paper collage, 9 1/2 x 6 1/8 inches (1959). Private collection. “Eva was a very good collagist, a great arranger; she could take anything and arrange it.” Ellen Leelike Becker, artist who was Hesse’s first-year roommate at Yale Univ. and a classmate at Cooper Union. 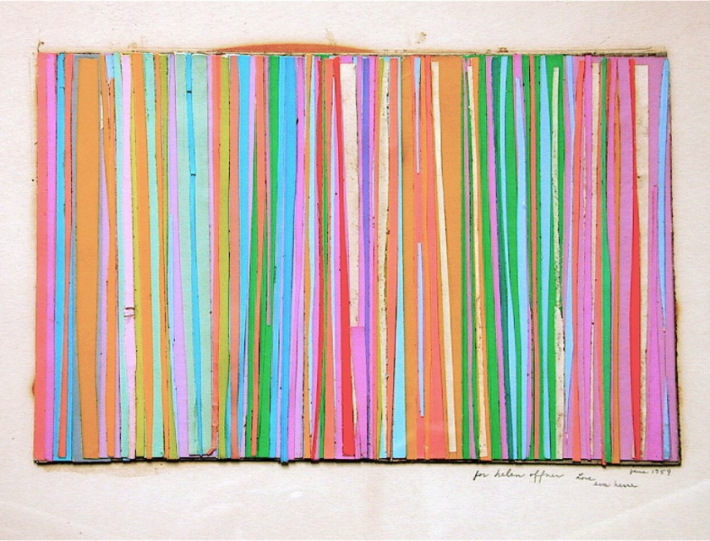 This multi-colored paper collage by Eva Hesse was made while she was an art student at Yale University. Hesse inscribed it, the month she graduated in June of 1959, as a gift to the infant daughter of fellow artist Elliot Offner who was also in the art program. It marks a critical moment when Hesse is exploring texture and color and still under the influence of Josef Albers (1888-1976) the well-known Bauhaus professor who was her professor at Yale and who had also previously taught at the experimental Black Mountain College. Eva Hesse (1936-70) earned her BFA from the School of Art & Architecture at Yale University in 1959 after studying at New York’s School of Industrial Design, Pratt Institute, Art Students League, and Cooper Union. Her studies at Yale had begun in 1957. Like Hesse, Elliot Offner (1931-2010) also was a protege of Josef Albers, earning both his BFA and MFA at Yale. He received his MFA in 1959 and joined the faculty at Smith College in 1960, remaining there until his retirement in 2004. Hesse and Offner both studied color theory and advanced painting with Albers who retired from teaching in 1958, the year before both students graduated. Thereafter Albers remained active as a painter and lecturer. In 1963 Yale University Press published Interaction of Color, his seminal exploration on color relatedness, which presented ideas he had been formulating for decades and which were prominent in his Yale lectures. Revised and expanded editions were published in 1975 and 2006. Detail of inscription: “for helen offner, Love eva hesse, june 1959″. 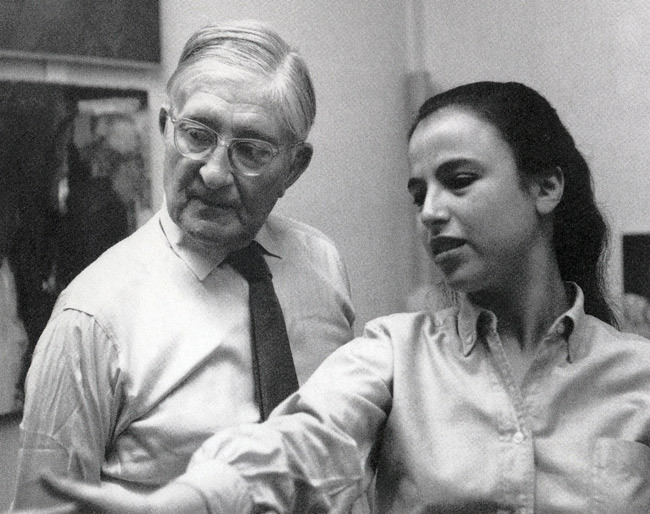 Josef Albers and Eva Hesse at Yale, c. 1958. Photographer unknown. The color collage from 1959 is a playful experiment in color and texture. 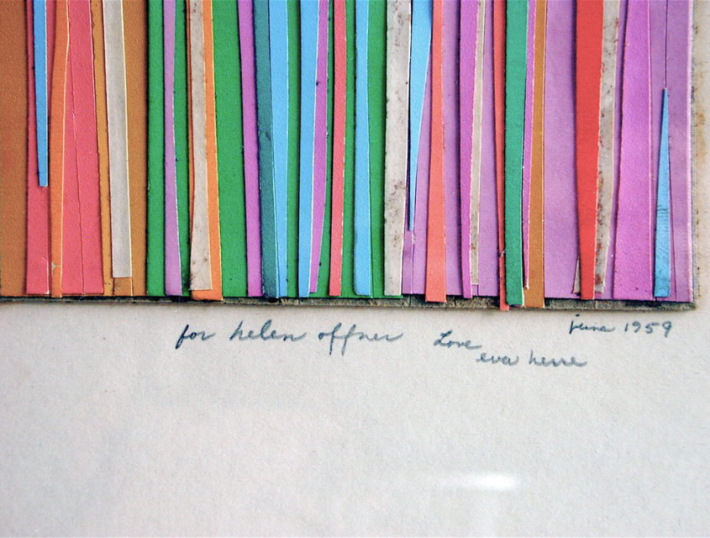 Hesse created a visually appealing collage for the child of a close friend, composed of matte-colored paper strips, in tones of yellow, pink, orange, and turquoise resembling a vertical candy cane. Yet from a mature artistic vantage point, Hesse builds up the texture of the paper into a tactile three-dimensional experience, that promotes precisely the optical estrangement Albers appreciated. The composition is less controlled and direct than Albers’ own work, but Hesse’s use of colors and their interplay evokes a calmness and invitation. Albers’ influence is evident. Although she was critical of the education she received at Yale and even of Albers, we should be careful not to give too much weight to sentiments that may not have persisted had Hesse had the opportunity to advance in age (she died in her early 30s). It is not uncommon for students who are already imagining more for themselves to find teaching stifling, yet in later years applaud it. For his part Albers considered Hesse his favorite pupil at the time, although his disdain for Hesse’s abstract expressionist painting was not disguised. Hesse is quoted, speaking of this relationship, in Catherine de Zegher’s Eva Hesse Drawing (New Haven: Yale University Press, 2006): “I was Albers’s little color studyist — everybody always called me that — and every time he walked in the classroom he would ask, ‘What did Eva do?’ I loved these problems but I didn’t do them out of need or necessity. But Albers couldn’t stand my painting and, of course, I was much more serious about the painting. I had the abstract expressionist student approach and that was not Albers’s”. While the color collage from 1959 doesn’t employ Hesse’s use of polyester resin, latex, fiberglass, and other industrial materials for which she ultimately become best-known, the sculptural effect hints at her future interest. She also utilizes the glue residue as a separate material to create an opaque effect on the paper itself, again suggesting her future preoccupation with materials and a reliance on various substances in her work. The color collage is a perfect bookend to her formal art education. She concludes her academic career at Yale, and with Albers, with a collage gift that is made to a child who is likewise at the beginning of a new path. The color collage from 1959 dates from a moment Hesse was in transition. After leaving Yale, Hesse went to New York City and obtained work as a textile designer in 1960. In 1961 her first show, a three-person show Drawings: 3 Young Americans, featuring Hesse, Donald Berry, and Harold Jacobs opened at the John Heller Gallery. In 1963 she had her first solo exhibition comprised of drawings at the Allan Stone Gallery. In 1965 she had her first sculpture exhibition, in Düsseldorf, Germany, at the Kunstverein für die Rheinlande und Westfalen. 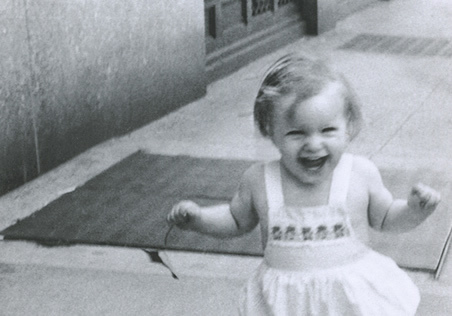 Four years later, after reaching critical acclaim, her artistic production was cut short when she was diagnosed with a brain tumor. She died the following year on May 29, 1970 at the age of 34. At her core Eva Hesse was a process-oriented artist who understood deeply the importance of materiality in a work of art; an idea evident in this early collage from 1959. Helen Offner, c. 1959. Photographer unknown. This entry was posted in Matt Gonzalez and tagged Elliot Offner, Eva Hesse, Josef Albers. Bookmark the permalink. Stripes are my favorite design!!! Thank you for introducing me to the work of Eva Hesse, what a phenomenal collage artist! It is really a shame that she died so young. I would have liked to have seen her work evolve even further.